Cook pasta according to package directions for al dente and then immediately rinse with cold water and drain. Set aside. Steam 2 cups of broccoli until crisp tender and set aside. In a medium saucepan, whisk non-dairy milk, nutritional yeast, miso, mustard, onion flakes, garlic powder, paprika and turmeric together and bring to a boil over medium heat, stirring frequently. Meanwhile, place tofu and 2-4 tbsp water in blender and puree until smooth. (Start with 2 tbsp and add more as needed). Set aside. Once the non dairy milk mixture is boiling, turn off heat and add in the pureed tofu and a few dashes of cayene if using. Mix thoroughly and taste for salt and pepper. 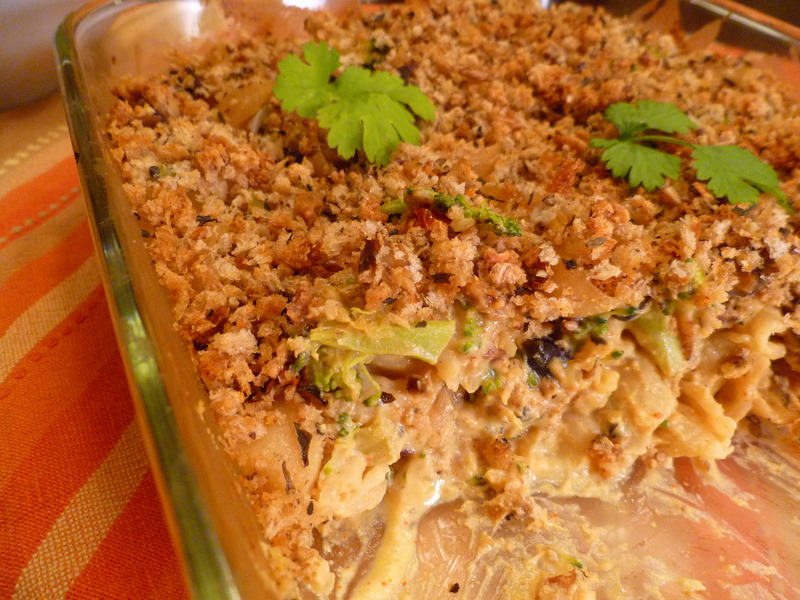 Place the drained pasta in a casserole dish and mix in the “cheese” sauce, broccoli and crumbled black bean or veggie burgers (I like the taste of black bean burgers in this dish). Stir to combine then top with bread crumbs. Place in preheated 350 degree oven for 20-25 minutes until heated through. I never buy breadcrumbs as I usually have bread around. I typically store mine in the freezer so I just take 2-4 slices out, break them into large pieces and thrown them in the blender until they are small crumbs. Spread them onto a large baking sheet and splash a few dashes of olive oil. Sprinkle on your herbs of choice (I like basil, oregano and garlic powder for this recipe) and stir to evenly coat. Bake at 350 until crunchy, about 5-10 minutes. These are way yummier than store bought, guaranteed! You can use any vegetarian “meat” you like. I love the taste of the black bean burgers and its a nice way to use leftovers from the night before when I had black bean burgers for a lunch or dinner. Other suggestions would be chopped vegan sausage links such as Tofurky or Gimme Lean sausage-style veggie protein. If you are using veggie burgers that you just cooked, you may want to crumble them then place them back on a cookie sheet and bake a few minutes. Otherwise they may be too moist. Don’t be afraid of this being too saucy. It dries out in the oven so the extra sauce really helps. When you pull it out of the oven, it will be perfect. I like to add some cauliflower to this too. 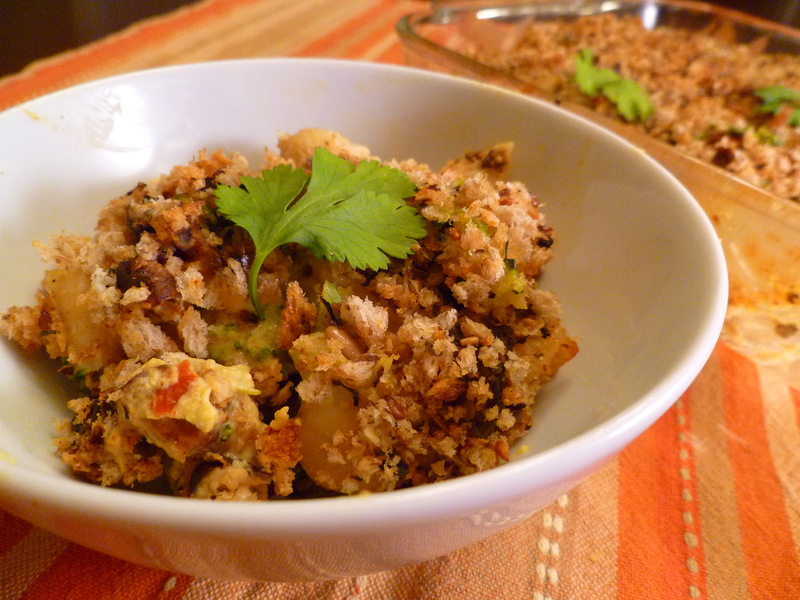 The mix of broccoli and cauliflower also add some nice texture. Looks great! I love me some vegan mac ‘n cheese. This sounds delicious! I’m going to try making this for sure! 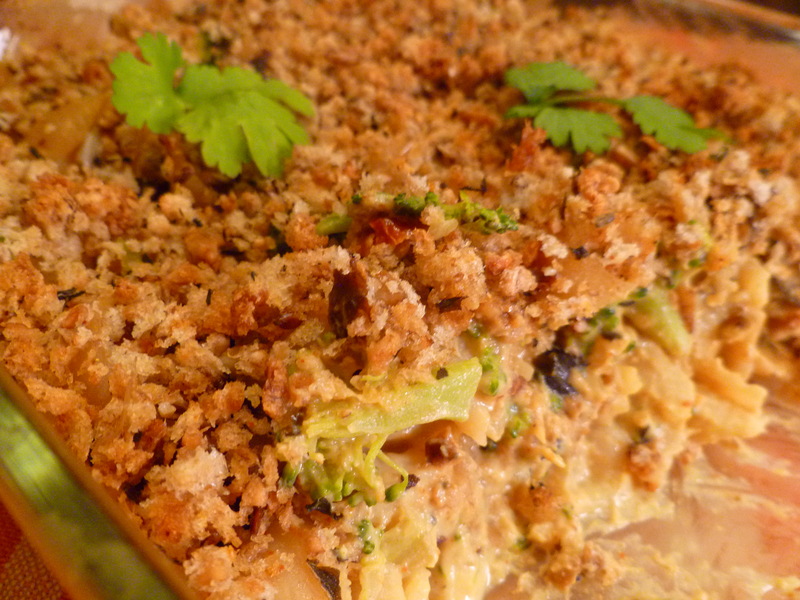 I’m always looking for a healthier alternative for mac and cheese, love it! This loos fantastic. My kids love Cheesy bakes, but now wehave had them diagnosed with dairy allergies they miss out. Trying this tomorrow! What a great idea to mix in the burgers into this. I always have those in the freezer. Your broccoli bake looks so scrumptious! Yes, I always seem to have those on hand too and yet I always forget I can use them for other things beside good ole burgers. I really love the flavor of a spicy black bean burger in this particular recipe. I hope you enjoy! I’ve tagged you for the Versatile Blogger Award. No obligations to pass along… consider this a token of my appreciation.